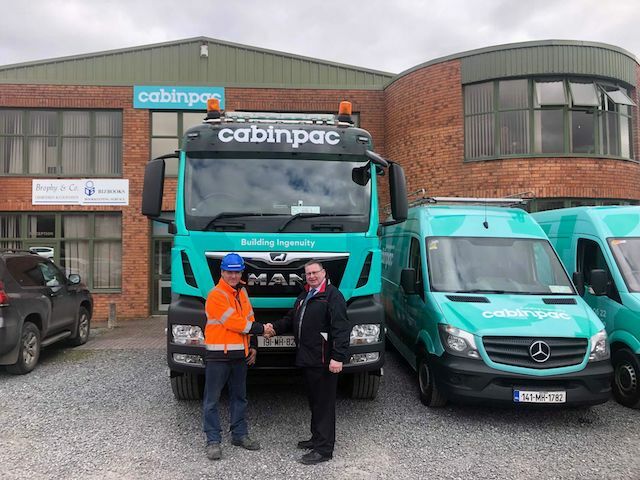 Cabinpac, an Irish owned company that specialises in modular innovative off‐site construction solutions, has recently taken delivery of a brand‐new MAN TGS Crane from MAN Dublin Sales Manager, Malcolm McKinstry. T he modular building manufacturer have successfully completed a rebrand of the company and the new TGS 26.500 makes a great addition to the recently updated fleet. The new MAN TGS 26.500 is a 6×4 Double Drive with a 500HP 12.4 litre engine, Tipmatic (c) Gearbox, equipped with a Palfinger PK76002 76 tonne crane. The vehicle was beautifully wrapped by V signs and cameras supplied by In Car Systems. MAN Sales Manager Malcolm McKinstry pictured handing over the new vehicle to Cabinpac driver Colm Kavanagh.